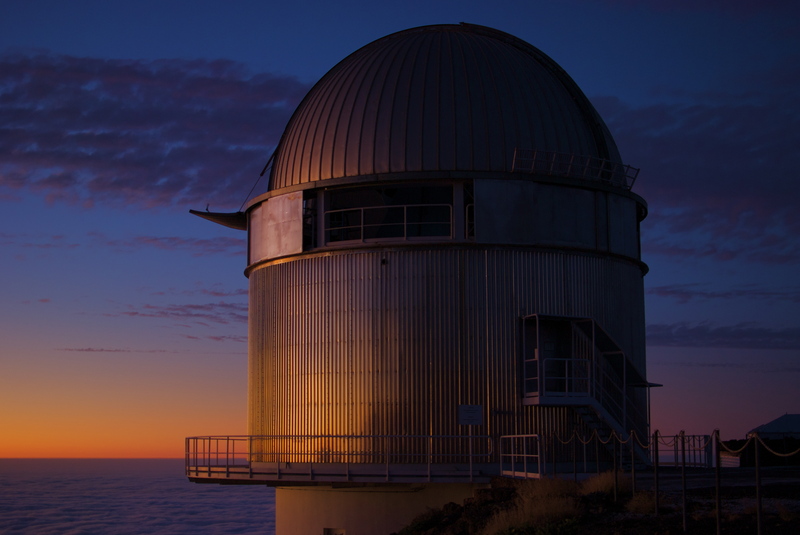 Astronomical observatories were not always as big as the huge constructs we see today, like the ESO VLT in Chile and the Keck Telescopes on Hawaii. Back in the day, they were much smaller. 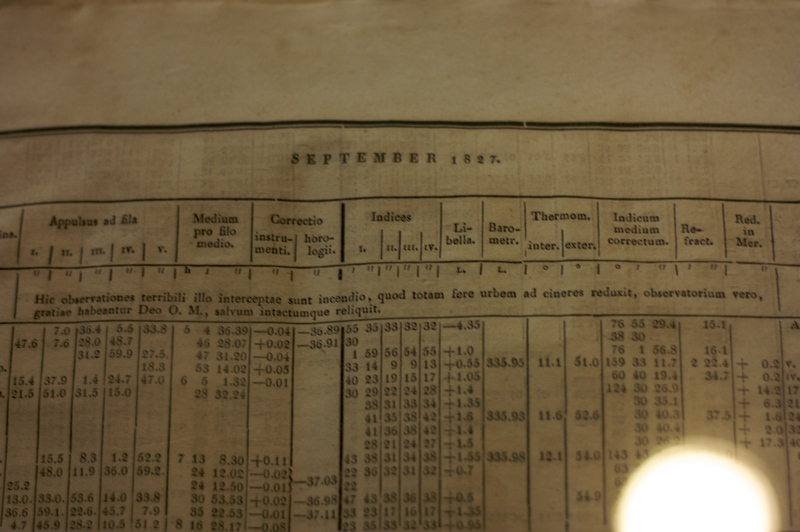 Pittsburgh’s Allegheny Observatory has the 13″ (33cm) Fitz Refractor, which was the third largest in the world when it was built in 1861. A 13″ lens is not all that big, and, in fact, it is possible for a single person to carry it away. This was what happened in 1872, when a thief stole the lens and held it for ransom. The old story goes that Professor Samuel P. Langley received a letter from the thief that stated that he should meet with him in the woods behind the observatory at midnight or he would never see his lens again. Supposedly Langley did meet with the thief and told him that no ransom would be paid. Prof. Langley and the thief the parted ways, without having resolved the situation, and the lens was still missing. It seems that a newspaper investigative reporter from the Pittsburgh Leader, who covered the case, was responsible for the eventual recovery of the lens. His investigation allegedly prompted the lens-napper to flee after a few months, for fear of discovery, leaving the lens behind in a hotel trash basket. The lens was badly scratched, so Prof. Langley sent it to the lens-maker Alvan Clark to re-polish, and it wound up better than before. Clark’s name was added to the now “Fitz-Clark Refractor” in gratitude. To this day, the identity of the lens thief remains unknown. Since the entire affair is so shrouded in mystery, the belief is that Prof. Langley knew the person that stole the lens and that it’s “safe” return was conditioned so that the thief would remain anonymous. It is of course debatable whether leaving the lens in a trash basket is considered safe, but at least it was recovered in the end. With the size of modern day telescopes, such things are unlikely to happen again, although it would have a certain entertainment value to see someone trying to sneak away with one of the 1.8m wide mirror segments from the Keck telescopes, or one of the 8m primary mirrors from the VLT. But one would certainly have to go to somewhat more elaborate schemes than just walking in and removing it, if one wants to pull such things off today. There are big telescopes, and then there are the truly humongous telescopes, like some of the radio telescopes. These bad boys are so big that the largest of them takes up an entire valley. 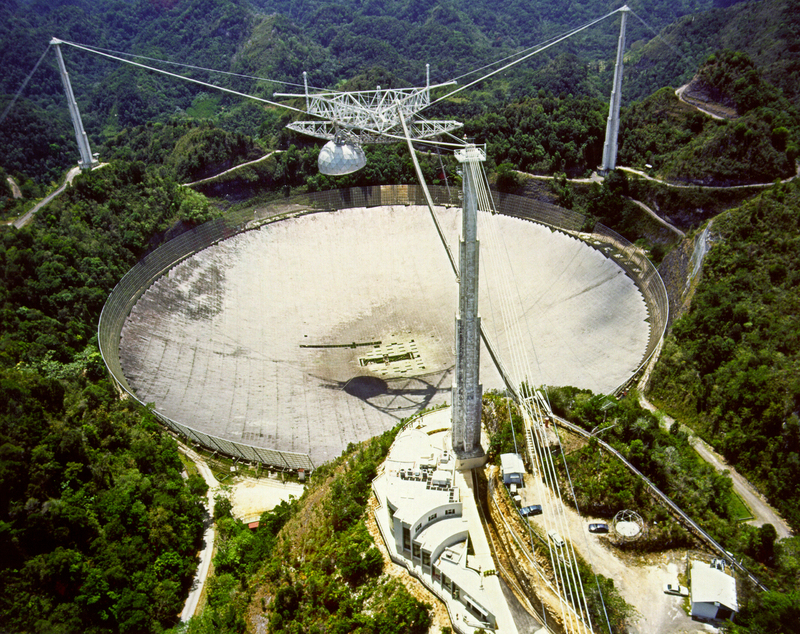 This is the well-known Arecibo Observatory in Puerto Rico, that a lot of people likely know from Golden Eye, X-files or Contact, to name a few times it has been used in popular culture. The observatories are, of course, mainly used to do astronomical observations, and not as fancy movie sets. 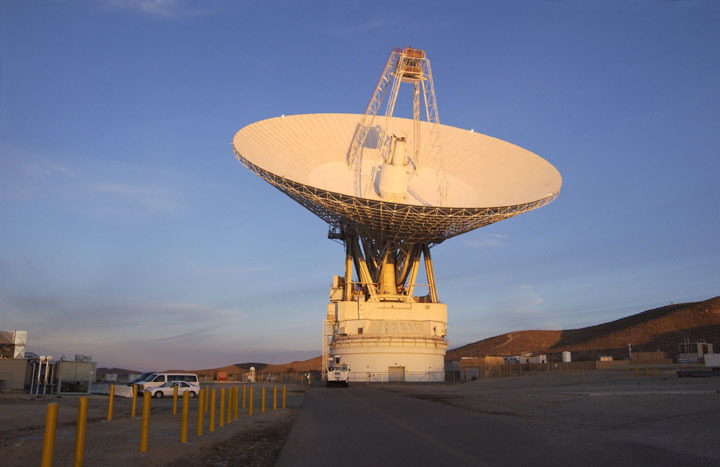 The planetary radar transmitter here, and at the Goldstone Deep Space Network site in California are used extensively to observe asteroids, the terrestrial planets, and the larger satellites of Jupiter and Saturn. To do this, they run hundreds of kilowatts of UHF signal out through each telescope. By the time the beam is distributed across the many thousands of square meters of the primary telescope reflector, it’s diluted to the point that it doesn’t pose a hazard to anything. However, along the beam path from the transmitter feed to the tertiary and then to the secondary reflectors, it is significantly more concentrated. This means that every now and then, the telescopes turn into something very different from instruments for peacefully observing the Universe. At Arecibo, the transmitters, receivers, tertiary, and secondary are all contained inside a Gregorian dome. Birds tend to fly in and get confused about how to exit again. As interesting as it may be to inspect the inside of the world’s largest radio telescope, this is not without risk! If the birds happen to be between the transmitter and the tertiary reflector when the transmitter goes on, they are very rapidly microwaved. The birds’ remains may then land on the tertiary, where they get cooked into char. They can be removed from the tertiary’s surface from the access platform by using sophisticated tools, like a large wad of sticky tape on the end of a stick. At Goldstone, birds can fly out of the beam line more easily, since the transmitter is not contained within a dome. But on one occasion, a swarm of bees were in the beam when the radar started transmitting. The telescope briefly acted as the world’s most expensive bug zapper. The resulting cloud of steam and fried bees caused a dramatic back-reflection of the beam until it dispersed. There are no reports (yet) of larger things being fried by any of these instruments, and, admittedly, it would take quite some work to get anything without wings to be in the right place. But you could host a rather impressive and efficient BBQ party there. Just be mindful of where you are, once the beam goes off. We don’t want any accidents! Thanks to Michael Busch for providing this anecdote. On the 5th of February, 1970, a rather bizarre incident happened at the McDonald Observatory, at the 2.7m reflector telescope. A newly hired employee was apparently very dissatisfied with his new job, or, something else was very wrong. Whatever the reason was for said person to be angry with the world, he had decided to take it out on the telescope itself. 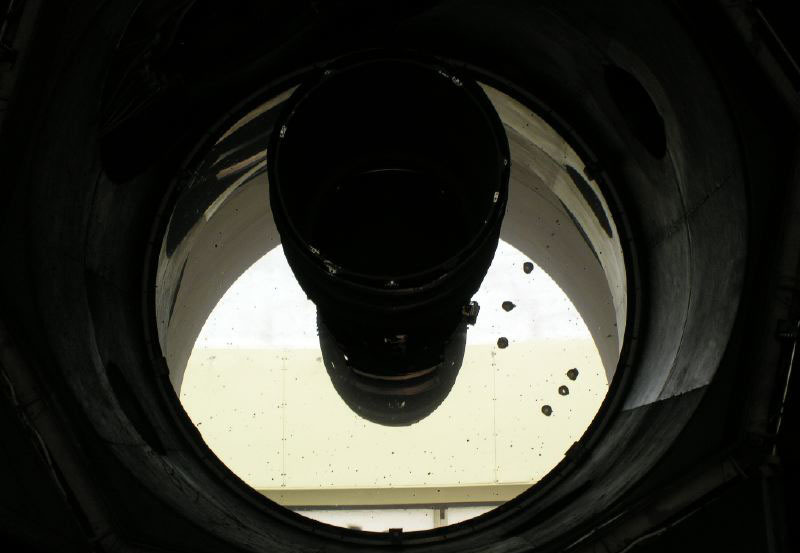 Bringing with him a 9mm gun, he first fired a shot at his supervisor, and then fired seven shots, point blank, into the primary mirror of the telescope, no doubt hoping to shatter it. Alas, big chunks of glass like telescope mirrors, do luckily not break so easily, so the bullets merely created small holes in the mirror. Not being happy with this outcome, he also attacked the mirror with a hammer, but to no avail. The mirror did still not shatter. Shortly after, the person was subdued by the rest of the astronomer staff, rushing to the site. 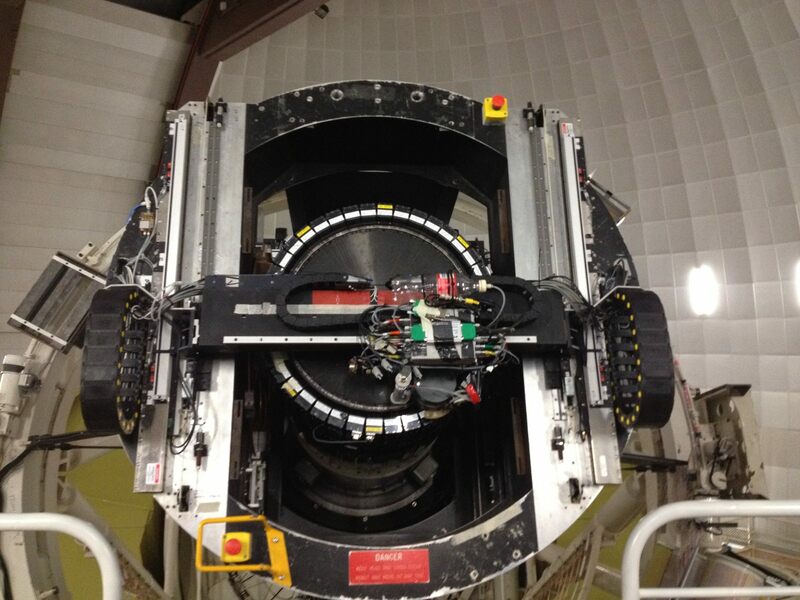 The primary mirror of the 2.7m telescope at McDonald Observatory. The bullet holes can clearly be seen. Photo credit: McDonald Observatory. This is likely the only telescope in the world who has been a victim of a handgun assault, and it will hopefully stay this way. The bullet holes can still clearly be seen in the primary mirror. Fortunately, no people were hurt during this rather tragic incident. It is well known that cars are often involved in accidents, either by crashing into something, running over things, slipping off the roads and similar nasty business. This is also true in astronomy, where accidents do happen from time to time. What is different though, is that while cars can run into things almost everywhere, having something running over your car is a much rarer experience. The Nordic Optical Telescope. Photo credit: NOT, Thomas Mellergaard Amby. Meet the Nordic Optical Telescope (NOT): A nice, 2.5m telescope of a somewhat peculiar design. Whereas all telescopes have some sort of turning dome, that allows the telescope to point to many different parts of the sky, the NOT is constructed in such a way that not only the dome, but the entire telescope building turns, when you want to aim your telescope at a different patch of sky. This of course involved some engineering challenges, like, plumbing (there’s no bathroom in the telescope), as well as an entry staircase that is attached to the telescope. Which, amongst other things, means that you never really know what direction you are facing when you leave the telescope. 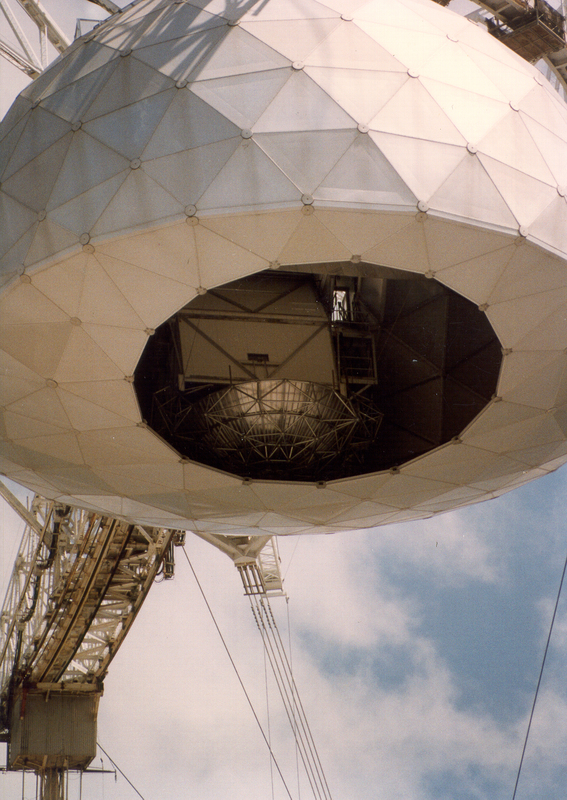 One day, the day-time crew were in need of hoisting equipment into the telescope dome, from the observatory pickup. For the crane to be able to reach the equipment, it needs to be positioned right at the wall of the telescope building. Thus, the pick-up was backed up, really close to the telescope, to make it easier to get the equipment in. This being an everyday operation, the crew unloaded the pickup, closed the dome, and proceeded with whatever they were doing. The one warning sign you do want to pay attention to. Shortly after, someone decided that the telescope should be put in the parking position, so it was ready for the night to come. A sensible thing to do, except that no one had checked if the pickup had been moved away from the building. Thus, as the building turned, the entry staircase rammed into the side of the pickup, with the telescope effectively running over the car. Fortunately, the impact cut the wires to the safety system, which happened to run along the staircase, forcing the telescope to an emergency stop. Had this not happened, the telescope building could have been severely damaged, and the pickup as well. The damages were luckily so small that the pickup could drive out of there, and at the time of writing, is still being used at the telescope. 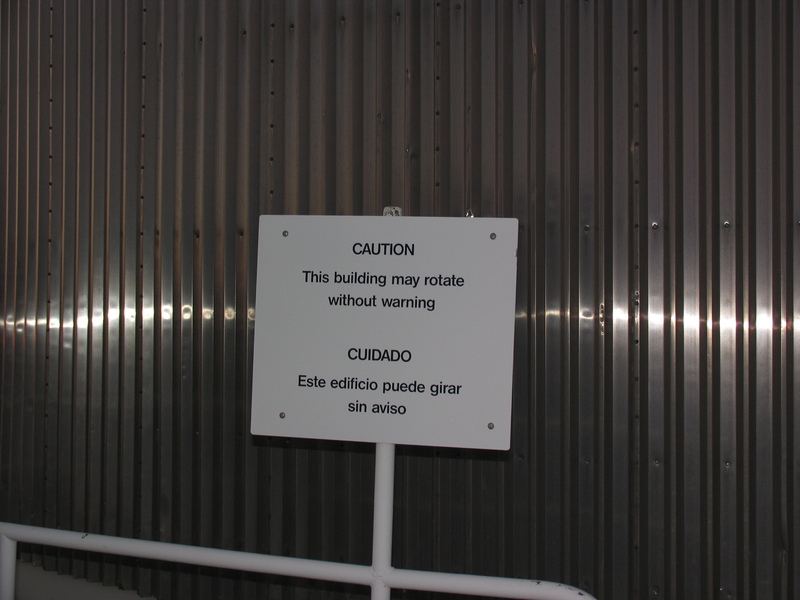 This is also one of the times where it really pays off to pay attention to the warning sign outside the telescope building.